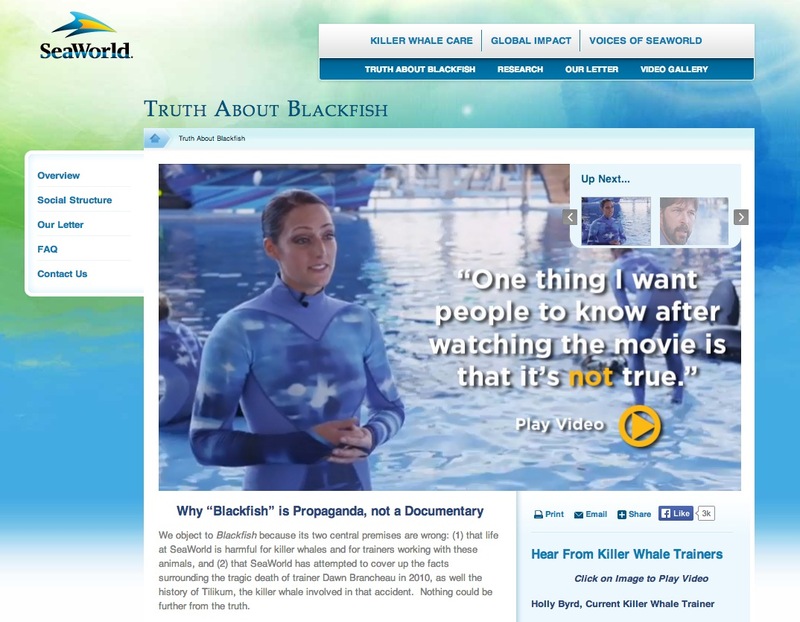 Arguably, one of the most talked about documentaries of 2013 was Blackfish. The documentary quickly became “the reason you will never visit SeaWorld again,” and gave viewers insight into how evil aquatic centers can be. Blackfish‘s availability on Netflix helped make it popular, and sure enough, at one point, if you hadn’t seen the film, then you were out of the loop. I have seen Blackfish, and I must admit, I was pretty moved by it. I have only ever visited SeaWorld once, and as someone who loves marine life, I made plans to visit it again sometime in the future. However, Blackfish made me see SeaWorld in a different way, and suddenly I doubted my future trip to the park. I willingly believed everything the documentary had to say, but I never really questioned the idea that there could be two sides to every story, particularly this one. Recently, I came across a webpage from SeaWorld themselves, refuting many claims Blackfish made against SeaWorld, revealing “Blackfish not as an objective documentary, but as propaganda.” As moved as I was by the documentary, I was quite intrigued in how SeaWorld was able to defend themselves, and now I’m in the middle of what was once a one-sided debate. It’s very interesting to finally hear what SeaWorld has to say about the Blackfish hype, and I’d encourage everyone who watched the documentary to take a look at this website. With this new information, it’s reminding me of the Kony 2012 events, and how people were so willing to jump to conclusions based off of one source. I admit, I can be one of those people, and gave in to the hype early on in both of these cases. But I’m all for hearing out both parties of a debate, so let’s give both sides an equal chance at telling the story. This entry was posted in AldyWaldy, Blog, Movies and tagged blackfish, kony, propaganda, seaworld. Bookmark the permalink.